Yorkshire Wine Experience: Some chunky reds and one cheeky summer time red. Some chunky reds and one cheeky summer time red. So apologies that this is my first post of the year I had meant to do more of a post Christmas review but that seems to be long gone now. In particular the Frappato from Marks and Spencer was excellent and there seems to be a real effort from their buyers to source some interesting wines from unusual places, Turkey, Georgia and the Lebanon all on their shelves. I will try to get more stuff up soon and get more regular posts but in the meantime here's a bit of a catch up. I'm going to put up some notes from a beer tasting recently which I hope will give some interest anyway here goes. I've had a few reds recently of varrying quality and here are a few bottles which caught my fancy I'll have another page up soon to catch up on some that I've missed off here. If truth be told I had hoped for a little more from this. Like most of us when I slash out on better quality bottle my expectations are raised and I want to be wowed. So if I am not and merely enjoy the wine rather than being transported by it, I feel somewhat let down. Unfair but true. Sadly then I have to say this wine did leave me feeling a little disappointed. Had it been a normal Rhône I would have been impressed by the structure of this inky glass of wine. There is plenty of spicy herby black fruit aroma and the flavour was pretty dense, savoury and almost gamey balanced by confected blackcurrant. But this is Chateauneuf du Papes, so that is a given, what I'm looking for is balance and a silkyness that was absent from this wine. I'm looking for a bit of wow factor to justify the price so an accomplished but unexciting wine is just not going to cut it. There are lots of great Rhone wines that are more than a match for this bottle, so to justify that extra fiver it's time to stop relying on the name and start putting the value back in the wine by being outstanding. 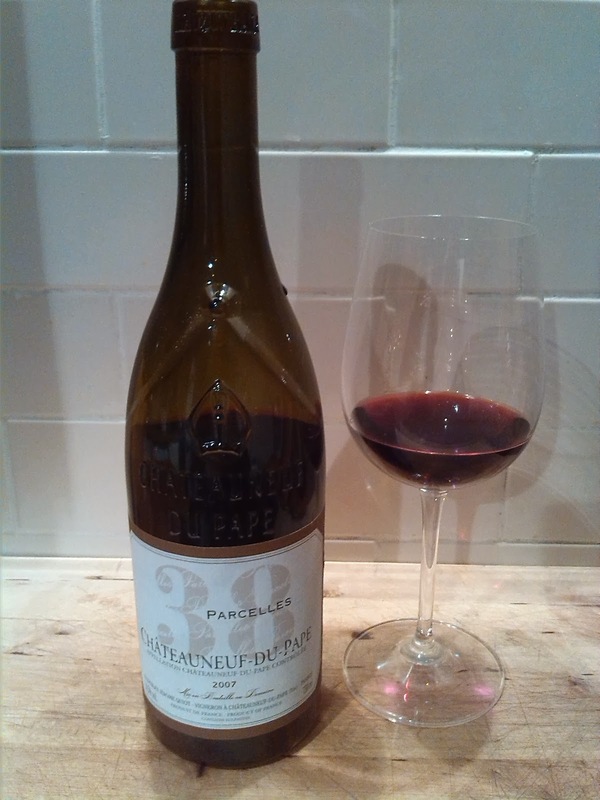 From the same producer this wine had some of the same character as its big brother but was not quite so heavy handed and as such the fruit which had been slightly hidden behind all the oak in the Chateau Neuf Du Papes made an appearance. A lighter wine and less complex no doubt, but for me anyway, all the more enjoyable. A hit of damson and prune with some clove on the nose followed on to the palate with a warming hit of alcohol and black pepper this had all the hallmarks of the Rhone Valley. Rasteau, Vacqueyras and Saint Joseph are well worth keeping an eye out for if you enjoy Chateauneuf de but want to get great value. The majority of Britsh wine consumers don't look for these regions and so prices are not so driven by demand as some better known appellations but deserve more of a following. This little beauty from M&S is a must for Beaujolais drinkers who fancy a change or don't want to come over all Alison Steadman when they have guests. This Sicilian fruit bomb has a massive summer fruit hit and zero tannin, it is unashamedly light and easy drinking but has so much flavour it never feels throwaway. I generally enjoy Yalumba wines and I also like odd combinations of grapes, so this blend of Spanish and Rhone grape varietals with an Aussie twist appealed. Yalumba seem to have a happy knack of producing expressive characterful wines with a bit of class even at the affordable end of their range. This had plenty to recommend it a big redcurrant and blackberry jam nose like an overfriendly labrador leaps from the glass. The palate is dry and the tannin as teeth staining as you'd expect of Tempranillo grown in the Barossa. I'm not sure what the Viognier contributes as it did not seem to give that lift here that it does so well in tandem with Aussie Shiraz. I was a bit confused if I'm honest, this didn't quite give the new world fruit boost to Tempranillo that Australia did for Shiraz while the Viognier doesn't change the character of the Tempranillo Grenache blend enough to seem like Rioja re-invented. I kind of just thought maybe I shouldn't have tried to be so clever and just bought something like the fabulous Condado de Haza from Alejandro Fernandez.